The more we riders understand about horse instinct, the better. Instinct is the starting place; a behavioral baseline from which other trained behaviors are built. So we study wild horses to find out what their language is like, how they experience family dynamics, and what it means to be a prey animal. We humans like things in tidy piles, so we label and over-simplify behaviors. Most are negative piles, like Arabians are spooky or Thoroughbreds are hot. It’s about as logical as saying Colorado riders are heavy-handed. We love to break herd dominance down into a grudge hierarchy from apha mare down to older gelding, because the view is easier in extremes. But looking at the lowest common denominator is deceptive. The old adage says that the alpha horse eats first. In captivity, it could be the ulcer horse who is more food aggressive, but we miss that message. I recently read a study that says in the wild, horses don’t compete for food, even in low availability situations. They cooperate. Instead of watching what makes horses different from each other, it would benefit riders to study the ways in which the herd works together, as a behavioral lesson for our partnership with them. Horses understand that they’re safer and stronger if they work together. One of my personal favorite herd behaviors is easy to see in August. Commonly horses are standing quiet, side by side and heads nuzzled close to a herdmate’s hind quarters, while tails flick loosely, working to move each other’s flies away. The larger the group, the closer they stand, breathing together and peacefully creating a breeze for each other. This vision of cooperation is what we should emulate. But even if our understanding of horse temperament is balanced and takes individuality into account, it is only half the picture. What about our own instincts? First, we’re predators. Our eyes are close together. We literally see everything differently. We’re bi-peds with opposable thumbs. Add to that the habit we have of teaching babies to grab onto our fingers as soon as they are born; we are a species that uses hands for communication and control. 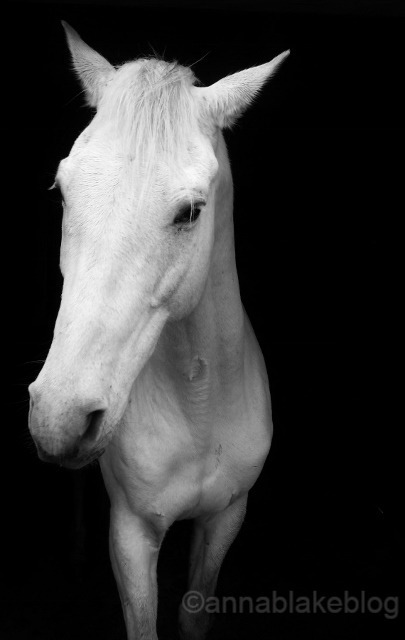 Where horses are ruled by their senses, we are ruled by our intellect. Our thoughts distract us from the natural world, and our senses are not very acute in the first place, compared to other mammals. The over-simplification of this is that we think and horses feel. We are one step removed from the physical world and when animals tell us something about that world, we don’t see or hear it as quickly. We use our brains to call them spooky, discrediting their frequently-correct perception, while affirming our reason. In the worst case, we are degrading their confidence while being arrogant about our own. Horses are kind of spherical in dominance ranking. Within the herd, there are friendships and preferences rather than a hard, fast top-to-bottom list. Too many humans relate to a horse as a black and white, right or wrong situation–that’s more about control then partnership. Blunt dominance is a kind of disrespect, by its nature, while partnership is more complex. Horses and humans are both challenged to stay balanced when we carry weight on our backs. We do have that in common. For us humans, we bring two other ingredients that are nearly combustible. First, we have passion. Desire is like pouring gasoline on a fire. We rush and hurry and if we don’t get an answer fast enough, we ask again, louder this time. Ambition about the future clouds the immediate. We surrender awareness in the moment and look to the end result, without involving a step by step path to get there happily. We see ourselves cantering rhythmically with our horses but we don’t know how to get them there without a fight. But that dilemma is tiny compared to this last ingredient needed for riding. Horses use their senses intuitively, yet nothing we do in the saddle is intuitive. Learning to ride is challenging because there is no part of it that comes naturally. Everything is a paradox. Staying in the saddle looks like sitting still, but bracing into the saddle actually pushes us out of it. Fluidity in the sit-bones equates to stillness, because what appears as stillness is actually us moving in unison with the horse. That’s the challenge of sitting the trot. Common sense tells us that if the horse bolts, hold on with your legs, but that’s their cue to go forward. We think we can control horse movements with our hands, but they listen to our bodies. Our muscle tension translates our true feelings, ones that we aren’t honest enough to admit to, while we think horses should be ruled by human logic. Horses inhabit each hair on their body while we have little body awareness. And it’s just like a human to judge someone else’s behavior rather than take control of their own. Most telling, on these hot August days, when a horse reaches to shoosh a fly, we pull that bit, metal on bone, to “correct” them. And finally, horses are flight animals and we like to stand and fight. Could we possibly be a worse match? We act like braggarts and monsters. Do we have any innate partner skills or are we control freaks? Our best weapon is compassion, but who trains that? On the other side of the balance, horses offer this one princely gift. They volunteer to join up with us. They reach out, even when afraid; even if humans in the past have been thoughtless or cruel. Still they offer their noble, sentient selves as partners. Perhaps they see even more possibility in us than we do in them. Stable Relation, a memoir, available at all online bookstores. ← No Permission. No regrets. Thanks Anna, a very thoughtful article. Finding much to agree with. Good way to start the day here on the farm. Thanks. Have a great weekend in the barn. Wow. All I can say is wow. You are right on the money and any horse in partnership with you is very lucky. Thanks. Horses taught me everything I know that matters. Thank you Janet. If you scroll to the bottom of this post, under share this, on the left is a blue circle with a lower case f in it… that’s the button that will take it to your FB page. Thanks again. Received my copy of Stable Relations Saturday am & finished it about 11pm – very very good read. Tears in several places, as in all our lives, but felt right at home from beginning to end. So enjoy your articles – keep it up. Thanks, Maggie. I appreciate the kind words. If you are inclined, I’d appreciate a brief review on Amazon, to give Google a reason to mention me to others. But either way, I am glad you liked it, and I appreciate your comments always. Glad to do a review on Amazon. And hopefully mine and all 60 of the other reviews will encourage Google to mention you! Thought provoking. True feel goes a long way to fixing the problem hey. And your new book – I gave it five stars and I don’t give them lightly, it was magnificent. Thank you, Jenny, instinct is a powerful thing…and truly a compliment on the book. Thanks for reading it and liking it so much. It was a labor of love. I surely hope my horses see something in me. Most times I feel like a mess but they work to reassure me. Thanks for writing. Some days we carry them, somedays they carry us. Keep at it. Thanks for commenting. Not sure I would agree that humans are ruled by their intellect. I would say that we are ruled, just like all other living creatures, by our emotions. Religion, violence, etc., are all a result of an emotional response to a perception of danger or death. Any violence underway right now is an emotional response. We can use intellect to calm our emotions and find a more productive way out of an unproductive situation (cognitive therapy. I admit I wondered about the right word choice for self-aware thought. Or the emotion that matches the action of arrogance. You are right, emotion is a big part of us. Thanks, I appreciate the input.